In 1991, Steve joined a local theatre group, which really sparked his passion for acting. He attended The Actor's Institute in NYC for two years. He has also studied acting with Michael Imperioli, Robert Funaro & Lisa Regina, and Al Linea. Steve networks within the industry regularly and is known as a friendly guy who is very hard-working. His commitment and dedication to his acting career makes him an asset to any project. 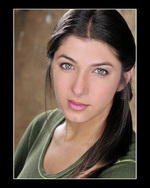 Lisa Di Gennaro took her first acting class during high school. She loved it and continued through college at CSI and then went to The Actor’s Institute in NYC for a year intensive. Throughout the years, she has attended many acting classes and seminars. She had joined a local theater group on Staten Island in the 90’s and performed many productions with them. After a 10 year break from the acting industry, Lisa is ready to dive in again. Her most recent class was with Al Linea at Brooklyn Actor’s Studio and she is excited to be a part of this show and looks forward to making people laugh. Christie is very excited about being a regular guest actress on Whatever Goes TV. She is the first and only Miss MySpace winner to appear in two Miss MySpace calendars. (Miss December 2008 & Miss January 2009). In April 2009, she was chosen as Miss Howard Stern and given her own segment for that month on Howard TV on Demand Cable. She really loves her work making appearances as a metal model/host to clubs in the area. She is known as the L'amours Rock Club Goddess poster girl. She made her acting debut in the lead role in Jim Haggerty's Grave Danger 2 by Yellow Ape Productions. Although life wasn't always easy for her, Zoe Labella continues to turn her negative experiences into positive ones. She achieves this by easily tapping into her emotions and using memories from her real life as a frame of reference for the wide range of characters she portrays as an actress. Her unique childhood consisted of a wide variety of troubling circumstances, ranging from an unstable living environment, to her now current state of many moments of total bliss. Aspects of her career include Acting, Modeling, & Hosting. Some highlights include being cast as the main characters in both; the award winning film BLOODLINE and the Bollywood feature HASTEY HASTEY: FOLLOW YOUR HEART. She's been published in a magazine as a model for Designer Hillary Flowers, interviewed by Sirius Radio on Maxim, and featured in an article in the Lynbrook/East Rockaway Herald. Nicole Rosenberg (Niki Ro) has a very strong passion for all aspects of the performing arts. She is an actress, model, professional figure skater, percussionist and certified makeup artist. She is also passionate about creating something from nothing, therefore enjoys writing as well. Frank J. Kosteczko (Frankie K) graduated from Mount St. Mary College with a Business Administration and Management Degree with a minor in Marketing. He is the Founder/CEO of FrankieK Clothing. Frankie is an aspiring actor who has worked on a variety of projects, which includes television,independent film and NYC theatre. He also plans to direct and produce his own independent film in the near future. Whatever Goes TV gives him the opportunity to try his hand at comedy. He thanks Steve DiGennaro for the opportunity to just have fun! Marissa has been acting, modeling and doing voice overs since the age of 4. She has done several commercials, music videos, voice over's, Independent films and games, as well as an animated series in Japan, and appeared on Third Watch, Queen Supreme and Small Pox on the FX channel. She has appeared in many school, camp and off off Broadway play's. She has been training since the age of 7 , she has studied at various acting schools including The NY Conservatory of Dramatic Arts/School of Film and Television, TVI, Weist Baron's Acteen, and The Neighborhood Playhouse and has taken numerous other classes. She is currently training with Caroline Thomas from Total Theater Lab. She loves being able to morph herself into characters. She is very excited to be part of this project and work with many of the actor's she has done project's with before, as well as her brother. She is looking forward to the next round and thanks Steve for this wonderful opportunity. Jakub is an actor, photographer, model and entrepreneur. Jakub is an adventurist. He is someone that makes things happen. Jakub cares about people and wants to inspire them through his work. He knows what it takes to be professional and create products for clients that will make a satisfied, lasting impression. website as well as contact info. Greg Indelicato has been playing music for more than three decades. A veteran of club stages and the studio, his original music has been played by The Mutts, Five for Fiber, and The Code Breakers. He made his acting debut in the film Shower Frown, playing Det. Ron Rainbolt. He also composed the music for the soundtrack. He is the writer & composer of the Whatever Goes Theme Song and also sings the vocals. His musical jingles will be heard throughout Whatever Goes TV Show and can also be seen in some segments. All though Craig is only 9 years old, he has been modeling and acting as early as 4 months old. He has appeared in several magazines, toy/box covers and editorials. He has done many commercials, TV shows including PBS Kids Block, Electric Company, Wack, Human Giant, Most Evil on the Discovery Chaneland Holiday's Greatest Moments on NBC. He also has worked on many Independent films, as well as working with Peter Fonda, Lauren Holly (play's his mom) and Kevin Zegers in The Perfect Age of Rock and Roll. He has also appeared in Willie Nelson's Grave Digger music video, as well as working on J Vokal's music video (Japanese recording artist). He really enjoys acting, and is having a lot of fun on the many projects he has been involved in. He also loves to yell action and cut! His passion is baseball, football and basketball, and hopes to be in the big leagues one day! He is very happy to be included in this wonderful project, working with his sister and many of the actors that he has become close with. He thanks Steve for believing in him and letting him in on this wonderful ride. Krissy is an award winning NYC graphic and website designer and a Staten Island native and current resident. An alumnus of the Fashion Institute of Technology and former head Creative Marketing Director, Krissy has designed the marketing collateral and websites for many popular events, businesses, and non-profits in New York City and all across America.